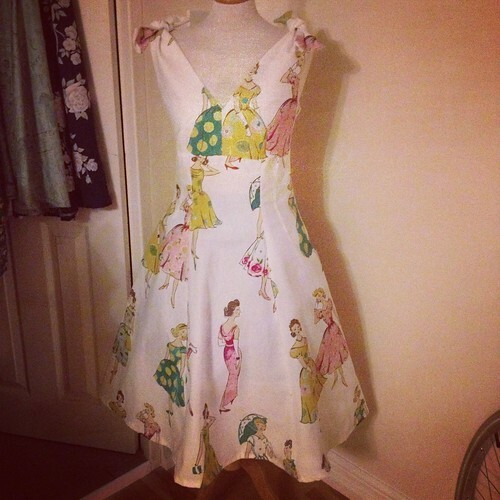 t*rexes and tiaras: February Round Up..
Well, if you're not interested in dressmaking, sewing or dresses, you're probably not going to get a lot out of this post. Stick around, by all means, just don't say I didn't warn you. 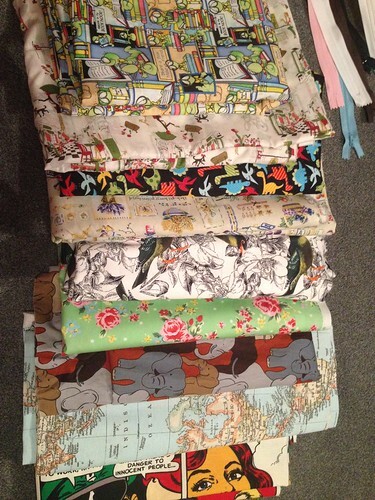 I started the month off with a fabric-shopping trip to Birmingham, and came back with a ludicrous amount of fabric. 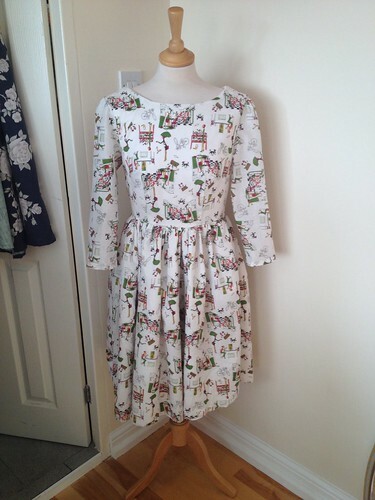 I did manage to get Dress Four made that very weekend; dubbed the #DollyClackettSewingBee. I've even worn it a few times since, which is good going for something I've made myself. Inspired by the weekend of stitching, during that next week I managed to finish off dresses five and six of the year.I then visited Pure London, to fill my head with thoughts of other pretty dresses which I want to make mine in the coming months. After hearing such good things about the pattern, I made my first Emery dress.I also bought a new kettle, and was sent a lovely Valentine's card. 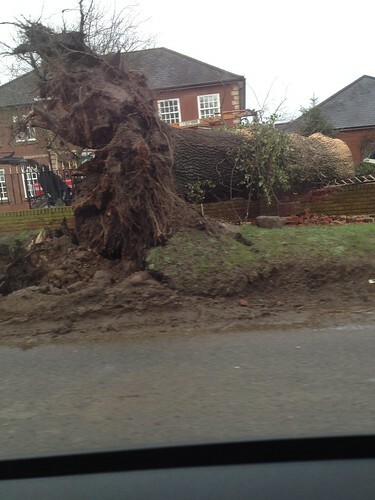 We had some ridiculous stormy weather, and a lot of trees fell down. This was the best one by far. I say best because this could be considered what some might call karma. More dresses, you say? Go on then. 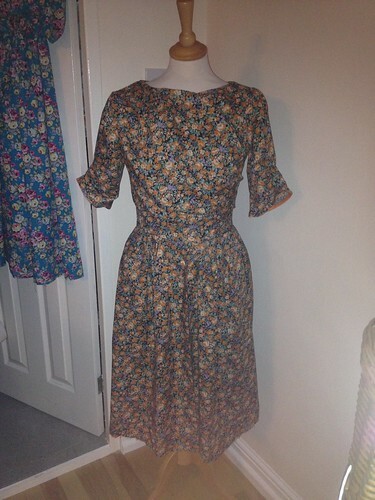 I rediscovered this vintage print fabric, which I couldn't think of anything better to do with than this Butterick dress, and then another Emery for good measure. I'm making some progress on number ten, which is going to be my #SewDollyClackett entry, but I don't think it's going to be done by the end of the month - quite. 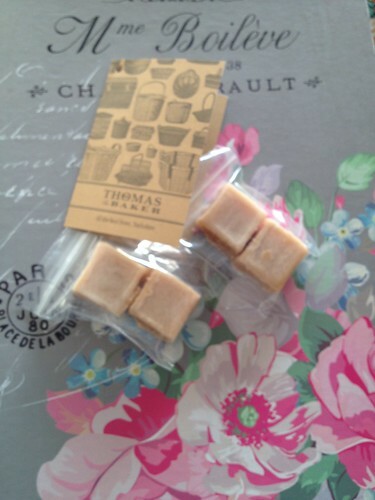 Finally, I was sent some free fudge by the lovely folks at Thomas The Baker - have you seen their site? Thank you - I love them all, but that Bookworm fabric was such a good find! Thank you :) I have amilliondresses' photo skills to thank for that, I'm sure! Ahhhh I spy the Robert Kaufman dinosaur fabric!! Have you decided on a pattern for that yet? 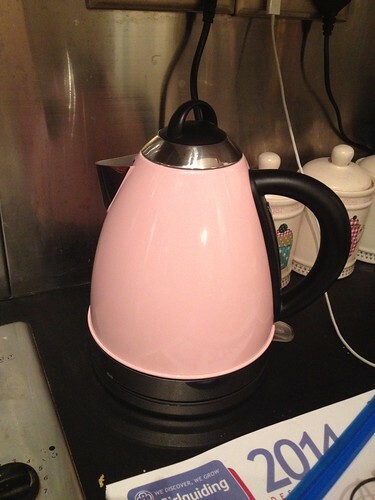 I love all your new dresses and very much approve of the pink kettle. Not yet decided what to do with the dinosaurs but it's second next thing to make. I want to get my #SewDollyClackett dress finished soon and then I'm planning to partake in Julia Bobbins' challenge, but after that I should be on to the dinosaurs! 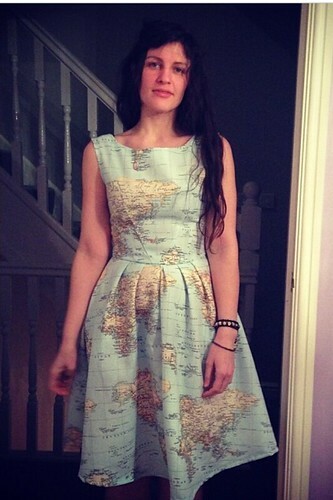 The map dress is gorgeous and looks fab on you :) I need a map dress and have thought so for a while! You definitely do - there's a lovely one coming out in Laura Ashley next month if you don't stitch? Free fudge?! Lucky you! 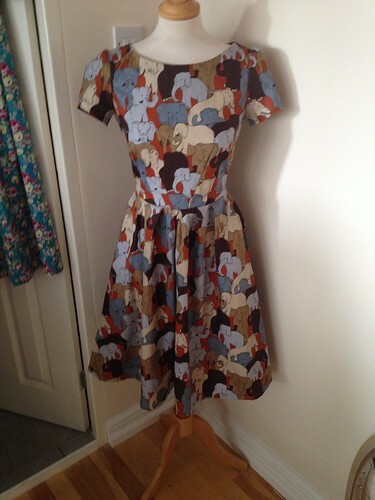 Anyone who isn't interested in sewing, dressmaking, or dresses is missing out on a lot, IMO! Great roundup. Have I said how much I love your bookworm dress? So much! Haha, well I think so too - there should be different things this month, though. 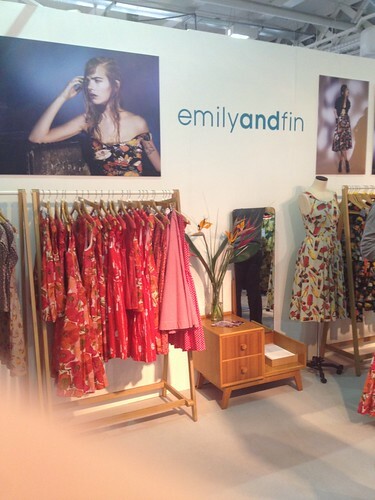 So cool,I love your dresses! 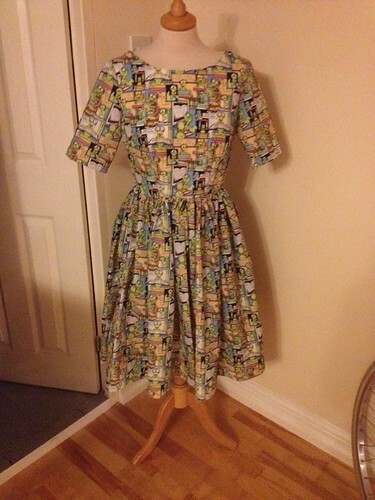 I dubbed a dress Roisin Muldoon( gosh,I wonder if she's a Mrs yet? )as well,that's so funny. She rocks I know.Sadly I can't connect to her blog anymore. It just sends me back to my own home page weirdly. Ah well...one day I'll be able to check in on her world again. Anyway,I am so excited to see all the dresses your making! 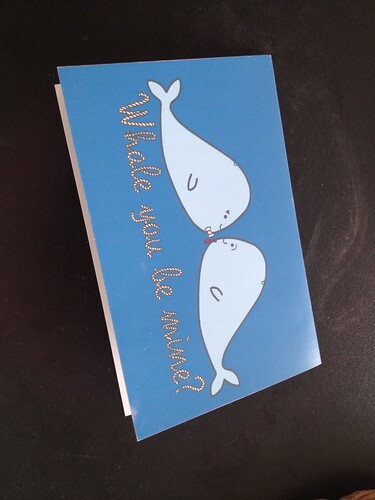 They are steeped in cuteness just as you are! It's always fun to see your newest fashions,yummy shoes,things you make,cook,blah blah...AND you are smiling!!!XOXO!!! She's getting married in April, I'm taking part in Sarah's #SewDollyClackett challenge in celebration of her wedding! Seriously wish I had half your sewing talent! Mine stretches to a bit of basic mending on the machine!